Damn Washington, That's an Impressive Landslide! A substantial landslide closed part of Washington state’s highway this week. The more impressive part? This mess is going to take days to weeks to clean up. 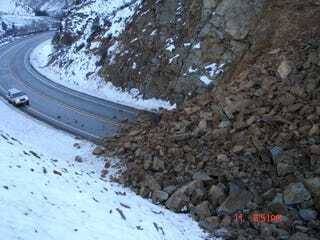 The rock slide closed a chunk of US2 in central Washington between Wenatchee and Chelan early on Sunday. The stretch of road—Pine Canyon in the Wenachee Mountains, part of the Cascade Range —is buried in rubble and large boulders. Local officials estimate that it is approximately 50 feet deep, and at least 100 feet long. It’s going to be a total mess to clear. Worse, the source area above the slide is visibly cracked and could easily crumble as additional landslides. Thankfully the road was clear when the cliff came tumbling down, so at least no one died in the disaster. At this point, the department is estimating days or even weeks before the road can be cleared and reopened. When a landslide like this happens, the Department of Transportation responds quickly to get on location and secure the site. Their geotechnical engineers evaluate current stability (or in this case, instability!) and slope condition, reporting on what steps need to be taken before reopening the road. The main idea is to identify any unstable bits that might fall down later, and make them fall down now. This way it’s a series of tiny, localized landslides slipping out in a controlled fashion instead of an epic catastrophe, all failing at once. For a cliff face like this, the department might hire blasters, but will certainly bring out scalers. Blasters are explosives experts similar to those used in avalanche control. Although more typically used to flatten hillsides into road cuts, blasters can also be brought in to step the entire hillside back if the engineers decide it’s a hopelessly unstable mess. Scalers are more peculiar. These slope stability daredevils tie off above unstable rock faces, then dangle on ropes chiseling away at loose slabs with a crowbar. They’re part of the spring ritual of landslide mitigation in mountainous regions, but they’re also great just after a disaster to knock down all the bits that are barely clinging to the cliff. They’re effectively agents of very quick, controlled erosion who jab at anything that looks vulnerable. Other possibilities include the installation of new landslide mitigation hardware. This could take the form of anything from bolts that screw into the cliff to secure large intact chunks, to fine netting draped over the surface to catch falling pebbles and redirect them into a roadside ditch. The Cascades are young mountains built by a mix of volcanism and tectonic activity in the past few million to tens of millions of years. The mountains are frequently sloppy piles of heavily jointed rock, stressed and scoured by even more recent glaciation. The result is weak rockfaces ready to fail with little provocation, often made even more precarious by carving roads through them. What we can see of the rock face from the photographs looks utterly, painfully typical for the region. The remaining cliff face is heavily jointed by cracks forming complex patterns that will be difficult to pin in place. Weathering on the newly-exposed joints suggest the heavy rains of the notoriously-damp Pacific Northwest have been infiltrating the cliff, weakening it further. Trying to figure out how to keep what rocks remain up on the cliff and not down on the road is going to be a challenge. This is going to be a mess to mitigate, and a mess to clean up. Looks like the folks of central Washington are going to be stuck with a long detour for awhile. Contact the author at mika.mckinnon@io9.com or follow her at @MikaMcKinnon. Mika is a landslide researcher, and loves case studies where nobody dies.